The first capital of Côte d’Ivoire, the Historic Town of Grand-Bassam, is an example of a late 19th- and early 20th-century colonial town planned with quarters specializing in commerce, administration, housing for Europeans and for Africans. 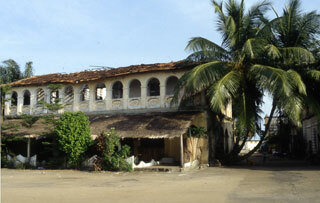 The site includes the N’zima African fishing village alongside colonial architecture marked by functional houses with galleries, verandas and gardens. Grand-Bassam was the most important port, economic and judicial centre of Côte d’Ivoire. It bears witness to the complex social relations between Europeans and Africans, and to the subsequent independence movement. As a vibrant centre of the territory of French trading posts in the Gulf of Guinea, which preceded modern Côte d’Ivoire, it attracted populations from all parts of Africa, Europe and the Mediterranean Levant. This article uses material from UNESCO World Heritage List article "Grand-Bassam", which is released under the Creative Commons Attribution-Share-Alike 3.0 IGO License.